What Happens To The Marvel Cinematic Universe When Joss Whedon Leaves? Marvel started making its own movies with Iron Man, but the quality control really got excellent starting with Captain America. Which happens to be around the time Joss Whedon came on board as a creative consultant. What happens to Marvel's movies when Whedon leaves? Nobody knows yet. But here's what we know so far. How soon is his contract up? He signed a three-year contract in 2012, covering the second Avengers film and helping to shape the next phase of Marvel movies following Avengers. This included a high-level strategic role, plus helping to create the Agents of SHIELD TV series. This contract reportedly expires in June 2015. How likely is he to renew his contract? The real question is whether he'd return to direct another big Marvel film — now that Avengers 3 has been split into two films, one of those two installments might seem less dauntingly high-stakes on its own. At the same time, Whedon seemed really reluctant to come back and direct Avengers 2, before he signed that contract with Marvel. He told Hero Complex, "You know, I'm very torn. It's an enormous amount of work telling what is ultimately somebody else's story, even though I feel like I did get to put myself into it. But at the same time, I have a bunch of ideas, and they all seem really cool." In other interviews, he said that ultimately, the decision to return for Avengers 2 was an easy one, because he felt that he still had stories to tell about these characters. He might still feel that way, but the next phase of Marvel's plan splits the crossover elements of the films between Captain America 3 and the two Avengers films, along with possibly Guardians 2. No one writer/director is going to get to handle the next interactions between the main Avengers players. Add to that the fact that James Gunn and the Russo Bros. have already been rumored/mooted as directors of either Avengers 3 or 4 (in both cases by Badass Digest). 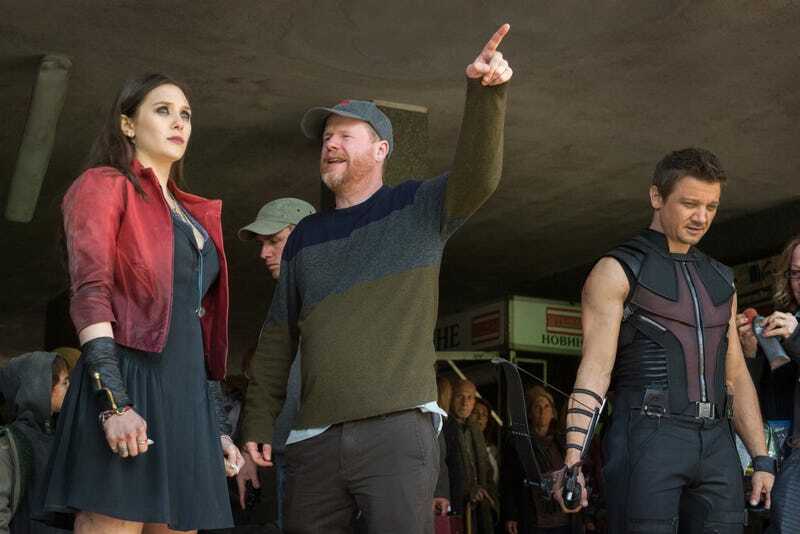 And by June 2015, Whedon will have been at work on Avengers and other Marvel projects since at least July 2010. Slashfilm recently wrote, "Everything I've heard is that Ultron has been a huge grind on [Whedon] so I think he's probably done for a while." How much has Whedon been script doctoring all of the non-Avengers films? Before Whedon became known as the creator of Buffy the Vampire Slayer, he was a sought-after screenwriter and script-doctor, who worked on Toy Story, Speed, Waterworld, the first X-Men and a bunch of other films. And it does seem as though Marvel's winning streak, creatively, coincides somewhat with Whedon joining the team. It should be stressed that Marvel has a ton of smart, creative people in the mix, including a slew of regular screenwriters as well as studio head Kevin Feige. At the same time, Whedon has a gift for character-focused storytelling and finding ways to keep larger-than-life hero narratives grounded, two areas where superhero films have often struggled. And where we've heard about Whedon's input into non-Avengers Marvel films, it's been described as making the characters stronger. Whedon's first act after joining Marvel was reportedly a script polish on Captain America: The First Avenger. He described this as making "some character connections" and taking some opportunities to find Steve Rogers' voice. Thor: The Dark World director Alan Taylor told SFX Magazine that "Joss came in to save our lives a couple of times," rewriting a few key scenes that weren't working, and later writing some new Loki scenes that were added in reshoots. Whedon told Moviefone that he had been part of discussions about Guardians of the Galaxy. "I've talked to them about the story from the beginning, and the different drafts, he said, adding that he'd been enthusiastic about the choice of James Gunn as co-writer/director. But he said his main feedback since then had been, "I want to hear more of James. Let's pull out the formula. Give me more James. Make it weirder." Of course, Whedon has also been filling some supervisory role on the TV show Marvel's Agents of SHIELD for the past year and a half. He told Entertainment Weekly in August 2013 that "I'm reading every script, every story, and giving notes and re-writes. I just can't be in the room every day." So it seems likely that Whedon has had some input into at least most of the non-Avengers movies Marvel has made since 2010, and the input we know the most about has been aimed at improving the characters and their interactions — the Loki scenes, in particular, are a saving grace of The Dark World. What will Marvel do without him on the writing side? This is really the crux — when Whedon leaves Marvel, will we notice a difference? Is there someone else who can step into the role Whedon has been playing since the first Captain America? Especially since Whedon is probably going to be leaving just as Marvel ramps up its most ambitious slate of stories, ranging from Civil War (based on a comic where Whedon helped craft the ending) to Dr. Strange to some kind of cosmic showdown involving Thanos. In a recent interview with JoBlo, Kevin Feige described a highly "collaborative" process of film-making, in which hired guns like Whedon, Gunn and the Russo Bros. take a lot of input from the Marvel brains trust and "elevate our initial idea." And even as Marvel has benefited from Whedon on contract as a script consultant, it's also been making moves towards developing more of its own bullpen of writers. In 2009, Marvel started its own in-house "writers program," in which a stable of aspiring film writers were basically doing work-for-hire on contract. Nicole Perlman, who co-wrote Guardians of the Galaxy, came out of that program. So did Joe Robert Cole, who reportedly wrote the first draft of an Inhumans movie. That program has apparently been shuttered now, but Marvel still seems to have a group of "in-house writers" on staff — including the uncredited writers who did the rewrite of the Ant-Man script that reportedly led to Edgar Wright's departure. Of course, the ad hoc role played by Anchorman writer/director Adam McKay in rewriting the Ant-Man script with Paul Rudd suggests that Marvel will keep pulling in whoever it can, to make the stories work better. We'll see over the next few years whether that's enough to help Marvel's films avoid the "made by committee" feeling. What will Whedon do next? There are a lot of possibilities — fans have wondered for years about his unfilmed screenplay Goners, and we've been waiting ages for Dr. Horrible 2. Plus he probably has tons of ideas laying around that he wasn't able to get made before he was director of one of the biggest movies of all time. The Avengers was a job and a really tough job. I can't say that about Much Ado. That was a gift, a gift from my wife who said, this is what you want to do. You don't want to travel. You want to do this. I remember thinking: Have I gone completely mad? Then, I'm shooting and I feel all the tension release from my body. It was amazing. When you work at something really hard, then working at something else is a vacation. I remember returning to work on The Avengers with a clearer eye and being more invested not because I have my art and this is my commerce but because the joy of storytelling is back.